Specially designed for a child's hand. 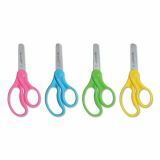 Westcott Kids Scissors, 5" Blunt, Assorted, 12/Pack - These children's 5" scissors with stainless steel blades cut paper, fabric, string and other craft materials. 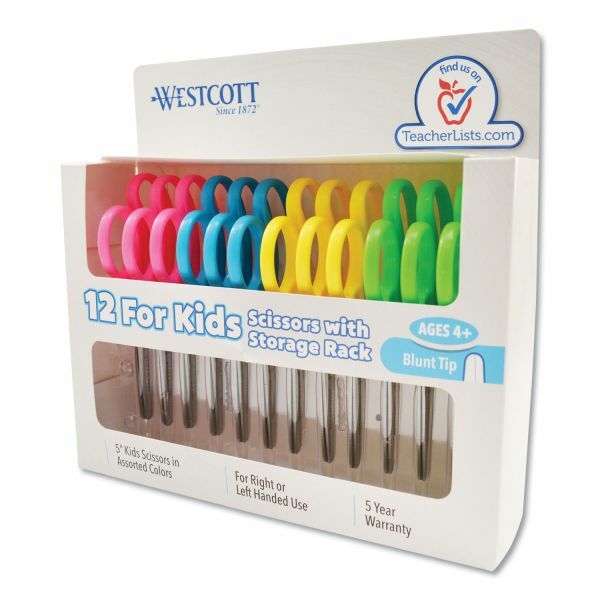 No-rust stainless steel blades are molded into plastic handles for added strength and durability. 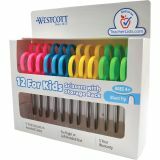 Handles designed for children’s hands, left-handed or right-handed use. Available with blunt tip for ages 4 and up; pointed tip for ages 6 and up. Assorted bright colors of pink, purple and blue.